Fresh from the success of the mega-hit movie “Kita Kita”, Empoy will once again delight his new legions of followers with his very own brand of comedy and ‘pampakilig’ with this latest romantic comedy, “THE BARKER,” directed by ace comedian Dennis Padilla. “THE BARKER” is Dennis’ directorial debut but it was a perfect chemistry for both Dennis and Empoy from the conceptualization of the movie up to the last shooting day. A double whammy for the fans of the two comedians! 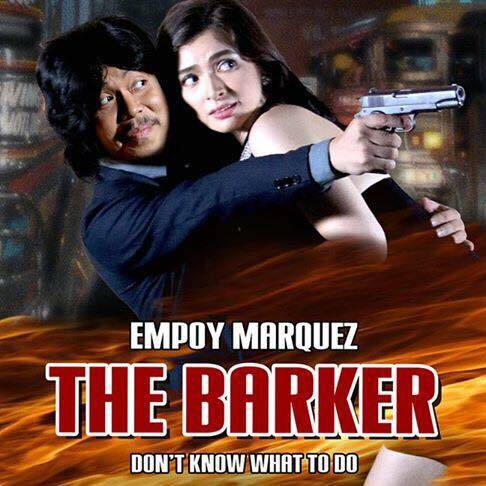 Fusing Dennis’ expertise in comedy and Empoy’s style, “THE BARKER” is a non-stop fun and entertainment of a movie that will surely tickle and ‘make kilig’ the viewers. "Kahit na this is my first time na magdirek, I never encountered any difficulties naman. Napakagaan na katrabaho ni Empoy. Para nga kaming naglalaro lang sa set. You will see it sa entire movie, yung good vibes, yung fun… everything!” enthused Dennis. The shooting for the movie began weeks before the theatrical screening of Empoy's mega blockbuster film "Kita Kita". As a fellow actor and now director, Dennis believed in Empoy's brand of comedy. “THE BARKER” is a co-production between VIVA Films and Blank Pages Productions, which is known for producing films based on true events that are socially relevant since its founder, Arlyn dela Cruz, is a veteran journalist. Joining Empoy and Shy in the “THE BARKER” are Jeric Raval, Wilma Doesnt, Ronnie Lazaro, Janice Jurado and The Greatest Love’s power couple Sylvia Sanchez and Nonie Buencamino. The film also stars newcomers Jemina Sy and Raffy Reyes. “THE BARKER” will open on October 25 in cinemas nationwide.